Perry White sits working in his office when suddenly he is interrupted by two people.�The white-haired siblings introduce themselves as Dale and Doloris, and then tell Perry that they have an offer he won't be able to refuse.�Perry steps towards the pair, but Dale just lifts Perry off of his feet and hurls the editor against the wall.�Doloris then pops open her briefcase and presents the Encyclopedia Universal.�They introduce it as the most comprehensive information source anywhere. Out in space, Superman receives a broadcast from a S.T.A.R. Labs platform.�The ghost of a parallel Earth is dropping into their galaxy, and if Superman doesn't reverse the process the world will be destroyed.�Moving into position, Superman begins to vibrate, exactly duplicating the vibrations of the incoming world.�The phantom planet begins to fade away.�On the space platform, men and women cheer as Superman saves the universe. As Perry struggles to his feet, Dale wonders how anyone could afford to not have a copy of the Encyclopedia.�Perry tells both of them to get the hell out of his office, but Dale just tells him that everyone seems to be turning town his offer.�With a word, flashbacks appear of the twins trying to sell their wares elsewhere.�President Luthor waves the two away and screams for Hope and Mercy to get rid of them.�Elsewhere, world leaders from Russia to the Middle East are shown the Encyclopedia, and all refuse it.�Across the universe, they try to push their product on Oans and Thanagarians, and in the 31st century Saturn Girl and Cosmic Boy of the Legion tell them that they don't need it either. Back in the Planet, Doloris tells Perry that he must fear what he does not understand.�Perry tells her he's seen stranger things that this, but then Doloris leaps forward and kisses him. In an instant Perry finds himself dressed in Kryptonian garb as he watches a ship blast skyward.�On Apokalips, he sees himself as Darkseid.�In a crazy world he is Chief Bizarro.�Suddenly Perry collapses to the floor, unconscious. In their apartment, Lois and Clark argue about something when suddenly Clark can hear someone outside the door.�He can't see them though, and that only happens when he is dealing with magic.�Opening the door, the twins rush past and immediately pull out their book.�Clark tells them that they have some nerve, when suddenly Doloris waves her hand and Clark finds himself in costume.�Another gesture and Superman and Lois, along with all of their belongings, are swept out of the windows by a gale force wind.�He tries to catch Lois, but Superman can't fly.�Right before they hit, they suddenly find themselves, under the sea. The twins sit across from them at a table, with Lois clad in typical mermaid attire.�They begin to tell the couple that they are interested in the mind's eye.�They can alter perceptions and make people experience things that are not there.�Lois grabs her head as she feels herself in other places, other times, but Superman tells her that it is just in her mind.�Superman then asks if this is the new system that he has to put up with.�Superman smiles at the magicians and tells them that he can play their game too.�Superman then imagines the twins' brains being probed by aliens.�The two are shocked, admitting that they actually felt that.�With a snap of their fingers, the twins send Lois and Clark back. In their apartment, Lois grabs Clark when suddenly the phone rings.�Jimmy tells both of them that Perry is in the hospital.�The three reporters stand on one side of the bed, with Perry's wife, Alice, on the other.�The doctors tell them that they don't know how long his coma will last.�Alice looks lost with him.�Pulling Clark away, Lois tells him to get Alice a glass of water.�Clark tells her that he thinks the game has just gotten more serious.�In the bathroom, the twins suddenly appear in the mirror and taunt him.�He yells at them for attacking Perry, when Lois suddenly opens the door behind him.�He tells her that round two is about to begin. Taking to the sky, Superman soars to the Lexcorp towers where the twins are hovering far above the ground.�He identifies them as Mxyzptlk, but before he can do anything else, they turn their powers against him.�Suddenly he sees a rocket blast through space, a cube of a world, and other strange things.�He tells them to stay out of his mind, but before he can strike at them, they tell him to wait.�Looking down, they smile as they remove Earth's gravity.�Below them, chaos begins. Story - 2: Yuck. I have a lot of problems with this issue.�The biggest I'll save till later.�Instead, I'll just start with the things that seemed wrong.�First off, the Encyclopedia Universal was a cheap rip off from Hitchhiker's Guide To The Galaxy (if you haven't read it, do, now).�The fact that the Legion mentions the HGTTG version called the Encyclopedia Galactica doesn't lessen the fact that it was a copied idea.�Next off, the whole ghost of a parallel Earth thing seemed way too much like Warren Ellis' work in Stormwatch/Authority/Planetary, where there is always a parallel planet showing up.�That could just be coincidence though.�What really bugged me is the casualness of that scene.�Superman just saved the omniverse?�By vibrating?�If the threat was really that dire, then I would have expected more attention to it.�As it was, it was just filler that was made to seem way more important than it was.�Who cares if Earth loses its gravity if the entire plane of existence was about to be wiped out eighteen pages earlier?�Then, while I liked the appearances of the Oans, Thanagarians, and Legion, it brings up the issue of time travel.�The Oans were either in the past or future, as all of them save Ganthet are infants right now, and the Legion is obviously a thousand years away.�If the twins can time travel like that, then they could never be defeated.�And even if they were sent back, the ninety day period wouldn't mean much since they could just jump back to right after they left as soon as they can get back to out dimension.�Finally, where was Keith?�I would have expected Perry's son to be there.�I realize that it wasn't a great idea to have Perry and Alice adopt him, but the story is there so they should at least acknowledge it.�Oh well.�My major issue though, is Mxy.�Why change him, and if you really have to change him, why into two annoying and stupid twins?�These two are nothing like Mxyzptlk, and that bothers me.�I don't see the reason to completely redesign sixty-year-old characters just to make a story for two issues.�How about instead of trying to shake up the status every month, they develop what they have instead?�This issue was alright, but it just doesn't accomplish anything good, and the things it does accomplish I already want switched back. Mxy has so much potential, but none of it is as a pair of annoying twins trying to sell an Encyclopedia. Art - 3: Contrary to the story, not much to say here.�It was average.�I didn't like Superman's face near the end, and overall the inking was way to heavy, but it was bad either. There are many unnecessary splash pages, stuff that was already done in the last issue. All in all, the story is conveyed, but it's very angry. That's not Superman to me. 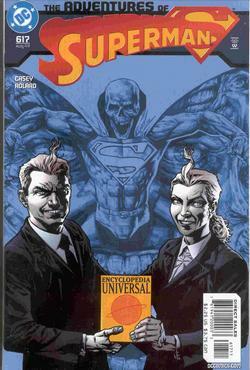 Cover Art - 2: And we have a really bad cover too.�To get it out of the way, the logo is annoying.�That said, I do give a point for the twins being on the cover with the Encyclopedia.�At least that happened in the issue.�But why is Superman a skeleton behind them?�Why is he jumping out of a giant face and why are there all the other agonized faces in the background?�The coloring is boring, the logo is bad, and only half the cover shows something from the issue.�A winner it's not.�Overall, I'm just hoping that the rumors are true that DC is going to be turning their attention to Superman after they are done tweaking the Batman books.�I just really hope it's true.